[Abstract] No evidence of effectiveness of mirror therapy early after stroke: an assessor-blinded randomized controlled trial. The aim of this study was to investigate the efficacy of mirror therapy on upper-limb recovery in early post-stroke patients. A total of 40 patients with upper-limb impairment due to a first-ever ischaemic or haemorrhagic stroke, within four weeks from the cerebrovascular accident. The intervention group received mirror therapy, while the control group received sham therapy. During mirror therapy, patients’ sound hand was reflected by a mirror. During sham therapy, an opaque surface replaced the mirror-reflecting surface. Both the mirror therapy and sham therapy groups practised their sound hand with exercises, ranging from the simple elbow flexion-extension to complex tasks (e.g. reaching and grasping). Mirror therapy and sham therapy were added to conventional rehabilitation. Primary outcome includes Fugl-Meyer upper extremity scale. Secondary outcomes include action research arm test (ARAT) and functional independence measure (FIM) scale. Outcomes were measured at the beginning (T0) and end (T1) of the treatment. At baseline, both groups (sham therapy vs. mirror therapy; mean (SD)) were comparable for Fugl-Meyer (30.9 (23.9) vs. 28.5 (21.8)), ARAT (25.1 (25.5) vs. 23.5 (24)) and FIM (71.0 (20.6) vs. 72.9 (17.8)) scores. At the end of the treatment, both groups significantly improved in the Fugl-Meyer (40.6 (21.3) vs. 38.3 (23.4)), ARAT (31.9 (23.0) vs. 30 (24.1)) and FIM (100.3 (21.9) vs. 99.4 (22.6)) scores. However, at T1, no significant difference was observed between the sham therapy and mirror therapy groups, neither for the Fugl-Meyer, nor for ARAT and FIM scores. Compared with sham therapy, mirror therapy did not add additional benefit to upper-limb recovery early after stroke. BACKGROUND: When solely mirror therapy is applied for a long period of time, spatial perception and attention to the damaged side may decrease, and the effect of mirror therapy may be limited. To overcome this limitation, it has recently been suggested that the combination of mirror therapy with mirror treatment is effective. AIM: The aim of this study was to investigate the effects of afferent electrical stimulation with mirror therapy on motor function, balance, and gait in chronic stroke survivors. POPULATION: Thirty stroke survivors were randomly assigned to two groups: the experimental group (n = 15) and the control group (n = 15). METHODS: Participants of the experimental group received afferent electrical stimulation with mirror therapy, and participants of the control group received sham afferent electrical stimulation with sham mirror therapy for 60 minutes per day, 5 days per week, for 4 weeks. Motor function was measured using a handheld dynamometer and the Modified Ashworth Scale, balance was measured using the Berg Balance Scale, and gait was assessed using the GAITRite at baseline and after 4 weeks. RESULTS: The experimental group showed significant differences in muscle strength, Modified Ashworth Scale, and Berg Balance Scale results, and velocity, cadence, step length, stride length, and double support time of their gait (p <0.05) in the pre-post intervention comparison. Significant differences between the two groups in muscle strength, Berg Balance Scale, gait velocity, step length, and stride length (p <0.05) were found. CONCLUSIONS: Mirror therapy with afferent electrical stimulation may effectively improve muscle strength and gait and balance abilities in hemiplegic stroke survivors. CLINICAL REHABILITATION IMPACT: Afferent electrical stimulation combined with mirror therapy can be used as an effective intervention to improve lower limb motor function, balance, and gait in chronic stroke survivors in clinical settings. We investigated the treatment effects of a home-based rehabilitation program compared with clinic-based rehabilitation in patients with stroke. A single-blinded, 2-sequence, 2-period, crossover-designed study. Rehabilitation clinics and participant’s home environment. During each intervention period, each participant received 12 training sessions, with a 4-week washout phase between the 2 periods. Participants were randomly allocated to home-based rehabilitation first or clinic-based rehabilitation first. Intervention protocols included mirror therapy and task-specific training. Outcome measures were selected based on the International Classification of Functioning, Disability and Health. Outcomes of impairment level were the Fugl-Meyer Assessment, Box and Block Test, and Revised Nottingham Sensory Assessment. Outcomes of activity and participation levels included the Motor Activity Log, 10-meter walk test, sit-to-stand test, Canadian Occupational Performance Measure, and EuroQoL-5D Questionnaire. Pretest analyses showed no significant evidence of carryover effect. Home-based rehabilitation resulted in significantly greater improvements on the Motor Activity Log amount of use subscale (P=.01) and the sit-to-stand test (P=.03) than clinic-based rehabilitation. The clinic-based rehabilitation group had better benefits on the health index measured by the EuroQoL-5D Questionnaire (P=.02) than the home-based rehabilitation group. Differences between the 2 groups on the other outcomes were not statistically significant. The home-based and clinic-based rehabilitation groups had comparable benefits in the outcomes of impairment level but showed differential effects in the outcomes of activity and participation levels. The intervention group received mirror therapy, while the control group received sham therapy. During mirror therapy, patients’ sound hand was reflected by a mirror. During sham therapy, an opaque surface replaced the mirror-reflecting surface. Both the mirror therapy and sham therapy groups practised their sound hand with exercises, ranging from the simple elbow flexion–extension to complex tasks (e.g. reaching and grasping). Mirror therapy and sham therapy were added to conventional rehabilitation. Primary outcome includes Fugl–Meyer upper extremity scale. Secondary outcomes include action research arm test (ARAT) and functional independence measure (FIM) scale. Outcomes were measured at the beginning (T0) and end (T1) of the treatment. At baseline, both groups (sham therapy vs. mirror therapy; mean (SD)) were comparable for Fugl–Meyer (30.9 (23.9) vs. 28.5 (21.8)), ARAT (25.1 (25.5) vs. 23.5 (24)) and FIM (71.0 (20.6) vs. 72.9 (17.8)) scores. At the end of the treatment, both groups significantly improved in the Fugl–Meyer (40.6 (21.3) vs. 38.3 (23.4)), ARAT (31.9 (23.0) vs. 30 (24.1)) and FIM (100.3 (21.9) vs. 99.4 (22.6)) scores. However, at T1, no significant difference was observed between the sham therapy and mirror therapy groups, neither for the Fugl–Meyer, nor for ARAT and FIM scores. [Abstract] Mirror therapy for improving lower limb motor function and mobility after stroke: A systematic review and meta-analysis. Mirror therapy has been proposed as an effective intervention for lower limb rehabilitation post stroke. This systematic review with meta-analysis examined if lower limb mirror therapy improved the primary outcome measures of muscle tone and motor function and the secondary outcome measures balance characteristics, functional ambulation, walking velocity, passive range of motion (PROM) for ankle dorsiflexion and gait characteristics in patients with stroke compared to other interventions. Standardised mean differences (SMD) and mean differences (MD) were used to assess the effect of mirror therapy on lower limb functioning. Nine studies were included in the review. Among the primary outcome measures there was evidence of a significant effect of mirror therapy on motor function compared with sham and non-sham interventions (SMD 0.54; 95% CI 0.24-0.93). Furthermore, among the secondary outcome measures there was evidence of a significant effect of mirror therapy for balance capacity (SMD -0.55; 95% CI -1.01 to -0.10), walking velocity (SMD 0.71; 95% CI 0.35-1.07), PROM for ankle dorsiflexion (SMD 1.20; 95% CI 0.71-1.69) and step length (SMD 0.56; 95% CI -0.00 to 1.12). The results indicate that using mirror therapy for the treatment of certain lower limb deficits in patients with stroke may have a positive effect. Although results are somewhat positive, overly favourable interpretation is cautioned due to methodological issues concerning included studies. Introduction ExoPinch is a robotic mirror therapy system for hand rehabilitation, focusing to increase the corticospinal excitability for the patients with hemiparesis. We propose that specific type of visual stimuli may be implemented in the action observation treatment to have a positive additional impact by activating the mirror neuron system (MNS) in premotor cortex. Recently, mirror therapy (MT) has been used as an alternative treatment for stroke of upper and lower limbs. In MT, the patient places the intact limb on the reflective side of a mirror and the non-intact limb on the non-reflective side of the mirror. Observation of the healthy limb’s reflection gives the illusion that the affected limb is functioning as instructed . The underlying mechanism of the MT of stroke patients has mainly been related to the activation of the neurons with mirror-like properties. They were first discovered in the macaque monkey ventral premotor area F5 . These mirror neurons discharge both when a particular action is done by an individual and when that same action done by another individual is observed. MT together with robotic assistive devices in the field of rehabilitation has led researchers to the robotics neuro-rehabilitation  and robots are particularly suitable for the application of motor learning principles to neurorehabilitation . In the robotic mirror therapy systems, the motion of the functional hand is tracked by the intact hand using the robotic system. Based on the properties of the MNS and its role in motor learning, this system has been activated as a novel approach for training in the rehabilitation of patients with motor impairment of the upper limb following stroke. 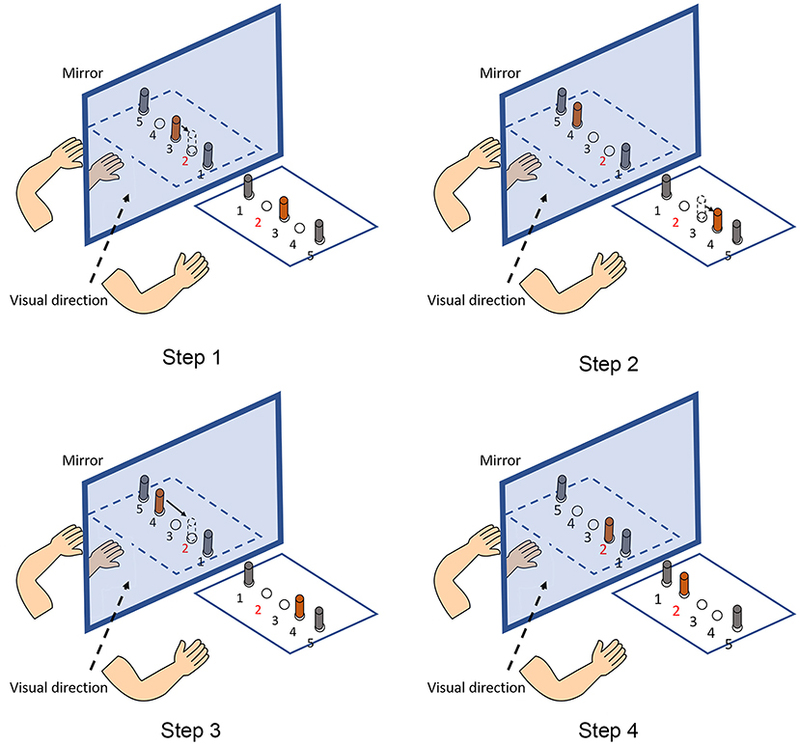 In this study, unlike the conventional mirror therapy where the functional hand motion is observed through a mirror, selected motions which provide higher activation for the mirror neuron system are observed through the prepared video streams aiming to improve the efficacy of the therapy. ExoPinch assists the patient’s index and thumb fingers to track the observed and imagined pinching actions. The selected motions are determined by the experiments on healthy subjects. In general, MNS is supposed to decode the kinematics of the observed motion. During the experiments, it is seen that the observed actions that include kinetic features (imposing force or torque) also increase the MNS activity. Therefore, the selected motions for the robotic mirror therapy system include features enforcing the kinetics, as well. This approach is supported by the motor learning principles where the kinematic and kinetic aspects are both concerned . Methods ExoPinch is an exoskeletal type of rehabilitation robot. The index and thumb fingers are the parts of fully-actuated mechanisms with 2 degrees of actuation and 1 degree of actuation respectively. The exoskeleton mechanism of ExoPinch is synthesized using genetic algorithm over a multiobjective objective function. The mechanism design is based on the kinematic synthesis and the optimization of the transmission angles during the pinching motion. Dynamical models are built in MATLAB and Simechanics. Passive joint torques of the index and thumb fingers with spasticity are modeled as well to introduce the resistances to the motion. 10 healthy volunteers participated in this study. In the experiments, the suppression (desynchronization) in mu band (8-12 Hz) power as an index of the human mirror neuron system (MNS)  was studied while subjects observed object-directed hand actions with varying kinetics and kinematics contexts: squeezing a hard and a soft spring; grasping a long and a short stick, Fig.1. Our main purpose was to explore whether observation of any of these actions may have a relatively strong effect on MNS activity. The activation of mirror neurons in premotor cortex during action observation plays a crucial role in observational learning , and rehabilitation is a motor relearning process . Therefore, the recruitment of MNS in this respect with action observation might provide an effective neurorehabilitative program for patients with strok that may lead to a personal optimal therapy in the future. Figure 1. Video library elements imposing kinetic and kinematic features Electroencephalography (EEG) method was used to investigate the activity of the MNS. EEG data were recorded continuously (bandpass, 0.1-100 Hz; sampling rate, 250 Hz) with the 16 channel 32-bit A/D converter using OpenBCI. UltraCortex Mark 2 dry electrode headset was used conforming international 10-20 electrode placement. EEG data were processed offline using EEGLAB. The mean mu (8-12 Hz) band power values (in dB) were extracted at a number of frontal (F7, F8), central (C3, C4) and parietal (P3, P4) channels since these regions almost exclusively included regions that have been associated with the MNS in the literature. Event Related Spectral Perturbation (ERSP) method was used for analyzing the mirror neuron activity in time-frequency domain. A two-way repeated measures of ANOVA revealed the main effect of video stimuli of squeezing soft/hard springs, at the frontal channels close to ventral premotor cortex area of the brain. These results showed that the observed actions imposing kinetic features can increase the MNS activity. Therefore, the selected motions to be observed by the patients will include the features that impose the kinetics, as well, aiming to improve the efficacy of the therapy. You are currently browsing the archives for the Mirror therapy category.